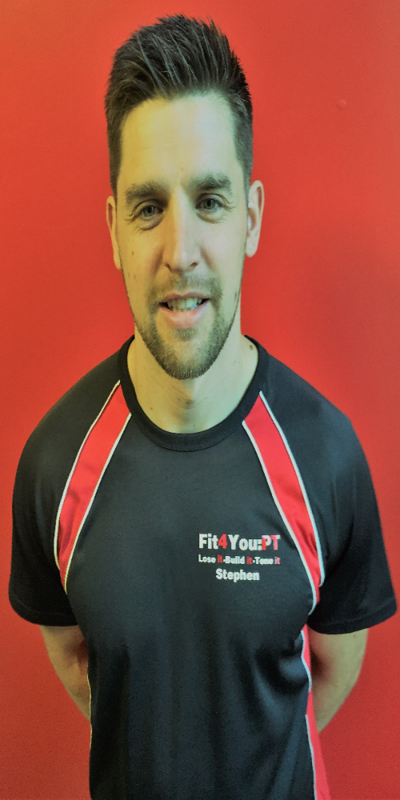 I’m Stephen, a personal trainer dedicated to sport, fitness and keeping fit. After spending 10 years as a postman, I decided to make a positive difference with my career and follow my passion for sport. Being a postman meant I was always active and in shape, and combining this with my passion for football and the gym has allowed me to gain sound knowledge of keeping fit. Since becoming a personal trainer I have gained extensive experience, and I am now able to pass on my knowledge, commitment and passion to you, my clients. I have now been a personal trainer 7 years, and am committed to helping people achieve their fitness goals through diet plans, nutrition, and drawing up specific programs suitably tailored to my client’s goals. I am a highly motivated person, which, I believe, is incredibly important as a personal trainer to give my clients that drive and energy required to reach their goals, which may once have seemed impossible to achieve. I work with a wide range of clients; male and female, young and old, competitive athletes and those wanting to lose weight and tone up. Whatever your goals may be, I am here to help you achieve them through my enjoyable and rewarding sessions, as well as my experience and knowledge. There is nothing more rewarding than seeing a client reach their goals and making a positive change to their well-being! Likes – Sports, training, spending time with my wife, food. Dislikes – Negativity. If you try to be positive you will have a better outlook on life.